To make the most of your Suunto Traverse, we recommend downloading the Suunto Movescount App and creating a free Suunto Movescount account before starting up your watch. Alternatively, you can visit movescount.com to create a user account. Keep START pressed to wake up the device. 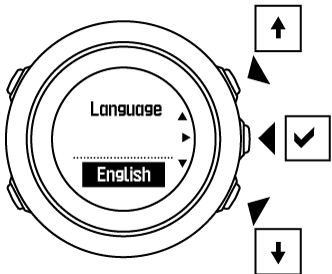 Press START or LIGHT to scroll to the desired language and press NEXT to select. Follow the startup wizard to complete initial settings. Set values with START or LIGHT and press NEXT to accept and go to the next step. After completing the setup wizard, charge the watch with the supplied USB cable until the battery is fully charged. 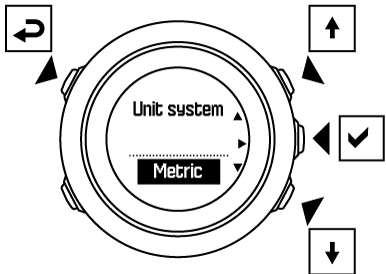 If a blinking battery symbol is displayed, Suunto Traverse needs to be charged before starting.